#‎ThrowbackThursday‬: In 1963 -- the year of President John F. Kennedy's assassination, Martin Luther King Jr.'s famous "I Have a Dream" speech, and the beginning of Beatlemania -- our Sheridan Junior High School (then Sheridan High School) was completed. According to thepeoplehistory.com, in 1963, the average cost of a new house was $12,650, the average income was $5,807, and the cost of a gallon of gas was 22 cents. It is amazing to look at this building and think about how much has happened and how things have changed since the year it was built. Pictured (from left) are Tim Armstrong, Marie Crawford, Kathy Grace, Mrs. Thornton, and C. W. St. John. 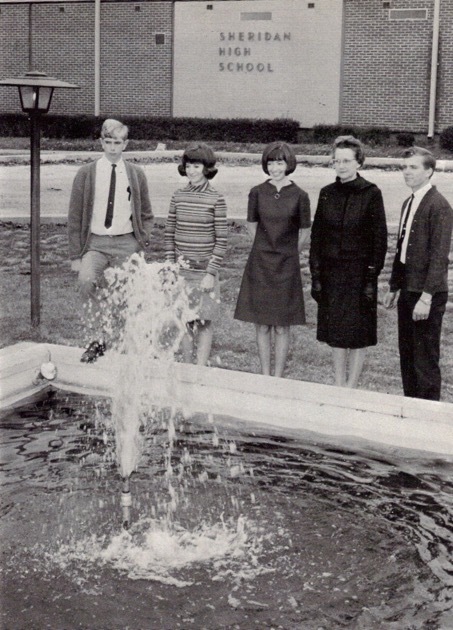 Soon after the building was completed, the student council built a fountain dedicated to sponsor Wilma Stephens Thornton. The project, with Arkla Gas lighting and colored floodlights, was intended to lift the spirits of the student body.